I bought this when my daughter was about 3 months old. She hates sitting in the car seat or traveling in the car. This take along is very good–it distracts her and keeps her occupied for a while. She loves looking at the bee with the mirror the most. The singing hippo, though attracts no attention directly, helps when she starts to cry. The only down about this product is the attachable clip. It does not stay on so well with my Graco carseat. I am not sure if it is because of my car seat is too big for the clip. I bought the Tiny Love Musical arch for my 3 months old daughter…I was expecting alot more with this products but was very disappointed with it.First of all you have to hit it really hard to get a tune to play and it does not stay on the car set or her chair the claws keep slipping off I plan to take of the toys and let her play with them..I would not recommend it to any one, a waste of money. 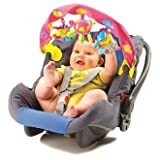 I bought this because my son, at 5 months, decided the car seat had become a torture device and cried from the moment he was strapped in. We were hoping this would distract him, but we could never get it to clip properly onto the car seat. It would usually fall off en route to wherever we were going and it didn’t do much to distract him. In the end we discovered a lullaby version of Radiohead’s “No Surprises” which was magical.